Here's something you don't see in the US everyday... A 1961 Skoda Felicia Convertible. Skoda is a Czech automobile manufacturer who started doing business back in the late 1800s. In 1991 they became part of the Volkswagen Group. 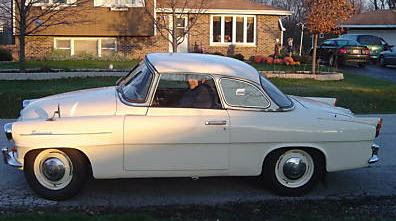 Skoda actually exported cars to the US from the mid 1950s until the mid 1960s. Although they were said to be well built cars, they found few homes in the US, as selling a car from behind the Iron Curtain during the height of the Cold War was no easy task. This car, according to the seller, was imported from the Czech Republic 5 years ago. The seller describes the car as being "85% restored", needing a clutch (he, thankfully, has the part and is including it in the sale), repairs done to the wipers and gas gage and some restoration done to the fiberglass hard top. I'm certain parts are not easy to find for this car (and impossible in the US), but fortunately, Skodas are supposedly tough little cars and need little work. I assume parts are available in Europe, but it will take some research to find them. I've never seen one of these in person, let alone driven one, but I suspect that with a 53 HP, 1100 cc engine, it's not all that quick, but it is said to have a top speed of around 100 MPH. With a fully independent suspension, I assume they handled well. This is probably not a car you'd use very often, but you'd almost certainly be the only one with one at your local weekend car show, and the "curiosity factor" alone would make this a cool car to own. There are few pictures and not a lot of info in the eBay listing, but the seller states he will e-mail more pictures upon request and, I assume, answer any questions you may have. The Skoda Club of Great Britain has been around for 45 years. Their website does not supply a lot of information, but does have links to people and businesses that may be able to help you with parts. Click here to see their site.